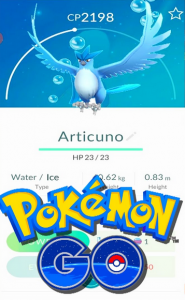 Articuno is a legendary bird Pokémon that can control ice which is in Pokemon Go. This is the Pokemon that Team Mystic is based on. One person had them in their game but Nintic quickly removed it from their account saying it was a mistake and the Pokemon wasn’t realeased yet. Need snow on Christmas morning? Well then just be sure to get yourself an Articuno! The flapping of its wings chills the air. As a result, it is said that when this Pokémon flies, snow will fall.